Any air conditioning over 10 years old probably uses R22 refrigerant, an ozone-depleting CFC which is now banned in new systems across the EU. 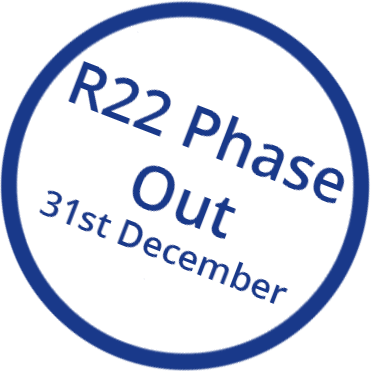 By law R22 systems will become unserviceable at the end of 2014, meaning they will be illegal to repair in the event of any failure. Many manufacturers no longer support these systems so spare parts are fast becoming unobtainable. So at some time in the near future you may be faced with no choice if your Air Conditioning system fails. The decision may not be as hard to make with the benefits presented by a new system. Use of environmentally responsible refrigerants such as R410a, R404A, R407c, R417A that are up to 60% more energy efficient than R22 systems and meet EU regulations. Replacement of obsolete fixed-speed compressor technology with modern digital inverter-controlled system will bring significant immediate energy savings of over 50%. New systems offer heat pump technology offering cost effective heating providing an alternative to conventional gas boilers. A new system will operate even more efficiently because it is likely to be working less hard and for fewer hours per day to provide the desired level of Heating and cooling. Installation costs may be further reduced when replacing outdated R22 air conditioning equipment as in some cases there may be the option to use Replacement Technology, retaining existing pipe work and electrical supplies. Many equipment manufacturers have introduced products specifically designed for this purpose, which can greatly simplify the installation and reduce disruption to building finishes and the activities of the occupiers. Assuming the pipe work is replaced or found to be in good condition, a new installation will offer improved resistance to refrigerant leaks, ensuring owners can more easily satisfy their obligations under the European Fluorinated Gases (FGas) Regulations. These regulations require annual inspections to be carried out by qualified personnel; ensuring refrigerant systems are free of leaks and in full working order. A new system is also far less likely to suffer a breakdown and the associated costs of downtime and repairs, and will commonly come with the added benefit of a manufacturer-backed 3 or 5-year warranty. Free Surveys and tax efficient lease purchase options are available with one of our engineers visiting your premises to evaluate your options and providing a replacement specification and quotation. Along with tax efficient leasing options you will have no major capital outlay to get your new system installed. How to know if your equipment uses R22? 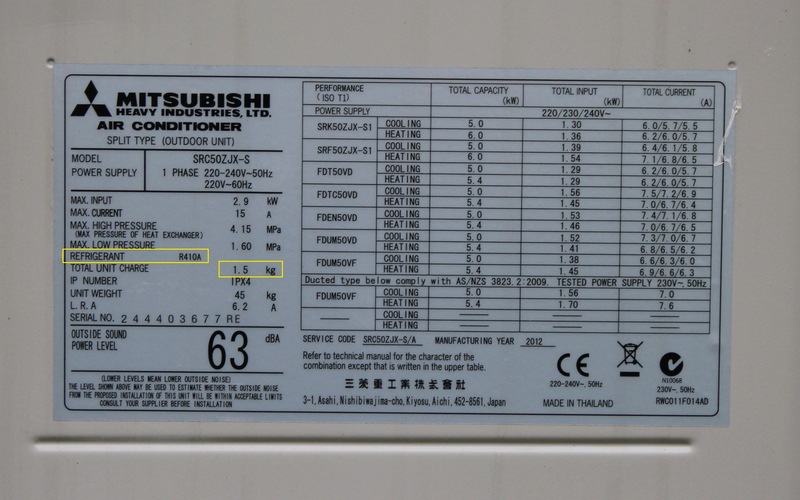 Most air conditioners have a name plate on the unit that identifies the refrigerant it contains and other information, such as safety certifications and electrical ratings. 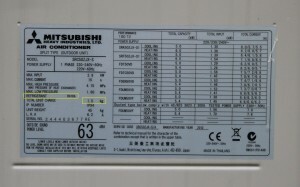 For some systems the name plate could be on the outdoor condensing unit. If a name plate is not provided there are several other ways that you may be able to obtain the information. You could check the owner’s manual for the information, failing that why not give us a call and we will advise you. If your system was installed prior to 2002 then you may have a system running on R22 refrigerant gas which, since 1st January 2010, it has been illegal to use new hydrochloro fluorocarbons (HCFC’s) such as R22 when servicing or maintaining air conditioning. We can upgrade your system to help meet government legislation, click here for more information. The Government’s commitments contained in the 1997 Kyoto Protocol came into force in February 2005. The aim of radically reducing the UK’s CO2 emissions has led to the introduction of the Enhanced Capital Allowance Scheme. This Government scheme allows any company replacing an existing air conditioning system with a more energy-efficient installation, to offset the entire cost of the project against its taxable profits in the year the new system is installed. It should also be remembered that a more energy-efficient system will enable building owners to achieve improved energy ratings under the Energy Performance of Buildings Directive. It is now a criminal offence to carry out activities that install, maintain or service stationary refrigeration, air-conditioning and/or heat pump equipment containing or designed to contain F-Gas refrigerants without the relevant qualifications and certification. Project Skills Solutions has, amongst other accreditations and certificates, a full Refcom F-Gas certificate. Call us now to find out how we can help you maintain the highest standards with your heating and air conditioning system and how you can keep to government standards and regulations.